In part one of our two-part series on FDA inspection of sponsors, we confirmed that no matter the extent of the responsibility delegated away to a CRO or other service provider, “the ultimate responsibility for the quality and integrity of the trial data always resides with the sponsor” (ICH GCP 5.2.1). We also discussed the most primary duty of the sponsor: oversight of the trial. Although 21CFR312.50 outlines the minimum requirements of oversight (selection of quality investigators, effective monitoring, and continued adherence to the protocol), successfully achieving the higher-order responsibilities of sponsor oversight represents only the final product of a far-reaching quality system. The basic expectations outlined in 21CFR312.50 fit together as part of a greater network of roles and responsibilities outlined in both Federal Regulation and ICH GCP. Since ICH GCP outlines the expectation of a quality system (and Federal Regulations mandate adherence to GCP), a sponsor’s oversight cannot take place in a vacuum. A quality system must be in place to continually verify that the sponsor’s obligations are being fulfilled. Yes, a sponsor may select investigators, monitors, and create a protocol. A sponsor may even delegate away these tasks to a CRO, but the sponsor will be forever responsible for systematically acting to ensure that the CRO (and sites) are meeting expectations. Weak SOPs: “The sponsor is responsible for implementing and maintaining… written SOPs to ensure that trials are conducted and data are generated, documented (recorded), and reported in compliance with the protocol, GCP, and the applicable regulatory requirement(s)” ICH GCP 5.1.1. SOPs written by the sponsor should not be idealistic, overly detailed, or a substitute for oversight, but rather should be concise, utilitarian, and objective-focused. Poor (or unclear) SOPs fail to account for the human factors that contribute to noncompliance and push stakeholders towards poor performance, no matter an individual’s level of motivation or competency. A sponsor’s SOPs form the foundation of a quality system. Poor SOPs, therefore, can doom a study before it even truly begins. “Failure to follow written procedures” is frequently cited on FDA 483 forms for a reason: SOPs are the expectations on which a study is built. Lack of Timeliness: Do your SOPs set an expectation of timeliness? An integral part of any quality system is the intentional and precise timing of events. Timeliness plays a key role in all aspects of a trial, from trial site to the sponsor’s portion of the TMF. When reviewing published 483s, the most common findings also seem the most basic: failure to follow the protocol, failure to secure IRB approval, high volume ICF mistakes, high volume drug accountability issues, critical CRF issues, or failure to report safety information. 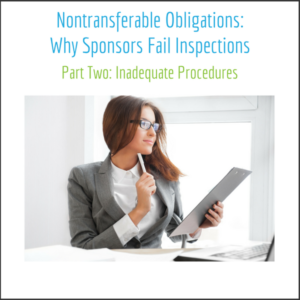 Although these common failures occur on the site level, they are sufficient to trigger a sponsor inspection as they are evidence of lack of oversight. Consider how failure to achieve IRB approval might occur: the site was under the impression that they had received approval but hadn’t because of the late filing of documents. Or perhaps this scenario was the cause of an ICF mistake: an ICF template was not shared with the site in a reasonable amount of time and was ultimately forgotten. Or even consider what increases the likelihood of drug accountability problems: the duration between last patient last visit and final drug reconciliation at the close out visit. Timeliness is a key tool in reducing the overall risk associated with any activity. Insufficient Records: All of your hard work doesn’t matter if the supporting documentation is missing or lacking in quality. In addition to the common 483 findings noted above, inadequate case histories and insufficient record retention are also frequently noted findings. The TMF should tell the story of the clinical trial to an inspector. Importantly, however, a healthy TMF can also be an exceptionally valuable prospective management tool for CROs and sponsors. When healthy, the TMF can be leveraged to provide metrics on timeliness, provide a snapshot of a site’s status, critique and monitor the implementation of processes and initiatives, and provide the sponsor with critical feedback about a site’s, vendor’s, or CRO’s performance. At the outset of the study, a plan for the TMF should be integrated into the overall quality plan for the study. The failure to maintain an inspection-ready TMF (whether at the CRO, the sponsor, or the investigator site) is not only a failure to meet regulatory requirements, but also a forfeiture of one of the most powerful trial management tools available. These three common sponsor deficiencies show the responsibility of oversight is far from one dimensional. Oversight is more than just monitoring and meetings, it means systematically ensuring quality and identifying risk through a quality system. Oversight also means leadership. For leadership to be successful, they must be able to leverage a TMF with up to date information. Leadership must be able to standardize procedures and uniformly delegate roles through functional SOPs. Sponsors who fail inspections usually strive to delineate where their obligations end. Sponsors who succeed embrace responsibility. They know they are the source of the expectations that protects subject’s rights and promote scientific excellence. They understand that some responsibilities are simply nontransferable.